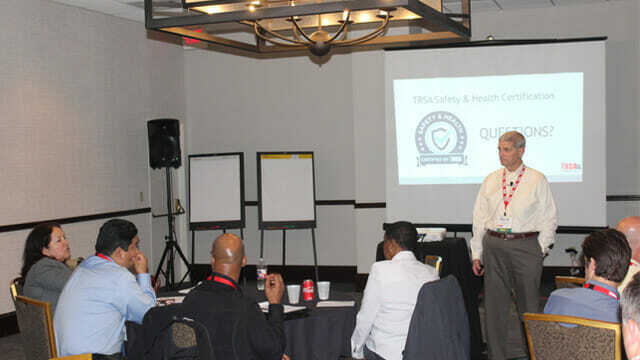 TRSA held its Eighth Annual Safety Summit on April 10 in Dallas. The event featured presentations, breakout sessions and roundtable discussions on topics such as electrical safety, ergonomics, hazard prevention, risk management, workplace violence and more. TRSA’s upcoming Safety & Health Certification also was introduced at the event. The Summit began with an update on the latest Safety Committee initiatives from the committee’s Chair Caleb Paige, Faultless Laundry Co., Kansas City, MO. After the update from Paige, the morning’s educational sessions got underway with a talk on workplace violence prevention by Isaac Monson and Ray Monteith from HUB International Ltd.’s Risk Services Division. Following Monson and Monteith’s presentation, Rick Gerlach of RG Consulting LLC, who previously spent 14 years leading safety and health initiatives at TRSA operator member Cintas Corp., gave attendees an introduction to TRSA’s upcoming Safety & Health Certification. Gerlach walked attendees through the proposed criteria of the certification, which is still being developed. The certification will go above and beyond OSHA regulations by requiring companies to have initiatives like a near-miss program in place, Gerlach noted. TRSA’s Workforce Management Summit took place the previous day in Dallas. For more information on that event, click here.